On my way to the salon today, I detoured across the street into Orange Theory Fitness. As I have mentioned a few times over the last couple of weeks, my motivation for summer shredding has been lacking a bit. I credit this to the fact, this is the first summer in 5 years that I don’t plan on stepping on stage. You guys know that this is my lifestyle. Whether it be bikini season, or I am bundled up in a down jacket, I am still in the gym 5 to 6 days a week, still incorporating cardio, but….I need a change. 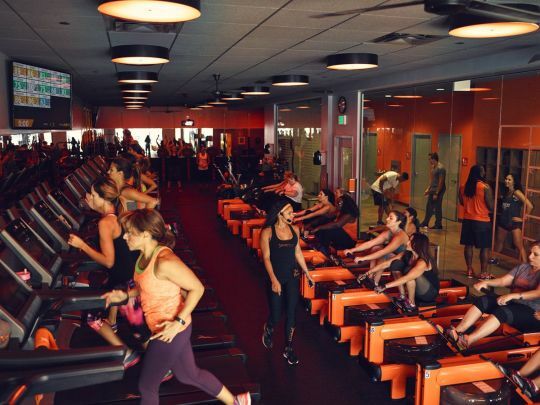 After doing some research about Orange Theory Fitness, I was intrigued. 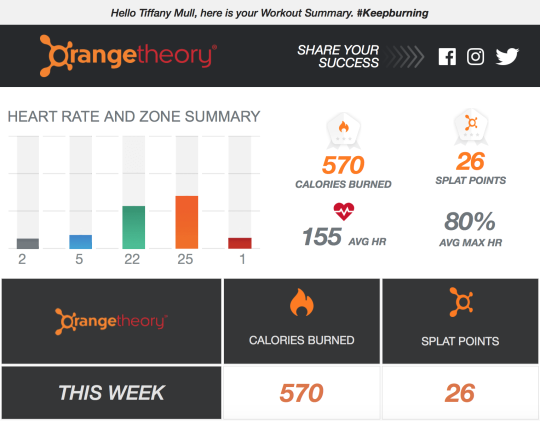 The “theory” behind Orange Theory seems to be scientifically based, and this science nerd is all about the whys, hows and facts behind everything. All of us fitness enthusiasts know that interval training in comparison to steady state cardio burns more calories post workout, and that is why HIIT training is so incredible!! My first OT experience was shared with two of my girlfriends, Kaitlyn and Kelly. We all three headed in to OT last week with a water bottle and no expectations. We arrived about 15 minutes early to fill out any needed waivers or paperwork. The first initial impression was, welcoming. The girl working the front desk was friendly, energetic and eager to offer assistance (but not in an overpowering, annoying way). People continued to trickle in, but with only 5 minutes to spare before class starting, we had no idea what we were going to be doing. The instructor was nowhere in sight. The front desk girl apologized for the instructor’s tardiness and took us into the gym area. We were instructed to take our pick of either a rower or a treadmill (not really knowing why). I never felt uncomfortable (but only) because I am familiar with the unfamiliar when it comes to training (thanks to many years of coaching and CrossFit). I tried my best to guide Kaitlyn and Kelly (who were a bit unfamiliar), through rowing techniques during the warmup. After a hundred meters or so, the instructor arrived. She apologized and jumped in. I will say that the guidance started off a little rocky. She was using the microphone to call out commands to the class, but not being familiar with any of their terms or “lingo,” I just rowed with intensity and assumed if I was screwing up royally I would be called out. We continued to row with uncertainty and when we heard “switch” yelled out, we just went with the flow of the others. After the warm up, we were instructed to partner up. I told Kelly and Kaitlyn that I would fly solo and try to find a regular member and they could pair together. I paired up with another female and the workout consisted of rounds for time of treadmill sprints, rowing sprints, and dumbbell work. After 60 minutes I was a sweaty, red-faced mess. Class ended and the instructor approached us with apologies for being late, and poor presentation of the class introduction. We assured her that our workout was great, and her tardiness was not the determining factor of our impression. After class, we were back up front to talk memberships. I chose the basic package of one session a week. This would allow me to get in 60:00 of HIIT training a week. This means all of my HIIT training for the week is taken care of in 1 class!!! 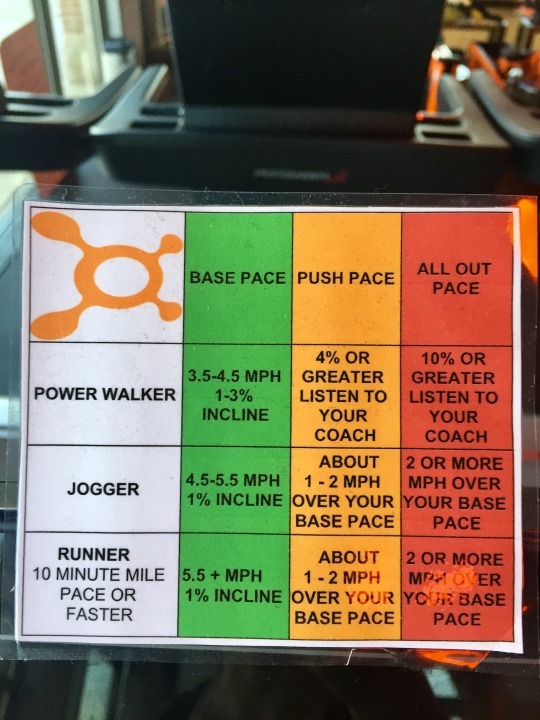 This is worth $59 alone, but when I told the girl behind the desk that I would sign up if she threw in the heart rate monitor ($69) for free, and she said “OK”, I was sold!!! *Class pricing varies by region, so it’s worth giving your local studio a call to find out the exact cost of a membership or class. 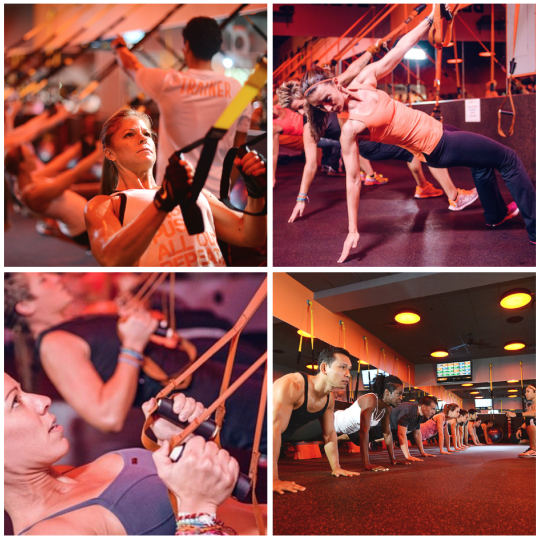 Your first class at any OTF is free; after that, the studio’s packages start at $59 and can go up to about $200 for an unlimited plan. The average price for a drop-in class for nonmembers is $28, with a few select locations costing slightly higher than this. Now, fast-forward another week and I came back for round 2, except this time at a new location. Last week I visited an OT next to the salon, but because I flew solo this week, I decided to go first thing in the morning to a location 10 minutes from home. Yesterday’s class was endurance based, meaning that we ran…a lot. We began on the treadmill with a base pace for 5 minutes, followed with a 10 minute push pace and 1-minute recovery- then, a 5 minute push pace, a 2 minute all out pace, 1-minute recovery and ending with a 1-minute all out, give it everything you got race to the end 💦. After running, we hopped on the rowers for intervals mixed with dumbbell work. After 60 minutes, my body was spent and my lungs were on fire (I loved it). What I find to be most successful about the OT approach is the use of the heart rate monitor. I began wearing a heart rate monitor years ago when I began training for my first triathlon, and have worn one ever since when it comes to aerobic and endurance training. Keeping a monitor on your heart rate allows you to you see when you’re crushing your cardio, as well as when you’re not actually working as hard as you think you are (this is usually the case). 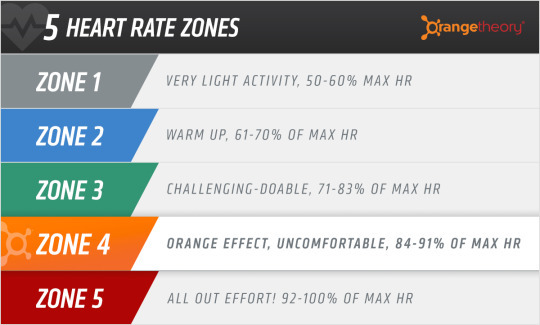 Your heart rate shows you exactly where you are, and where you need to be, and this method of training allows continual improvements. 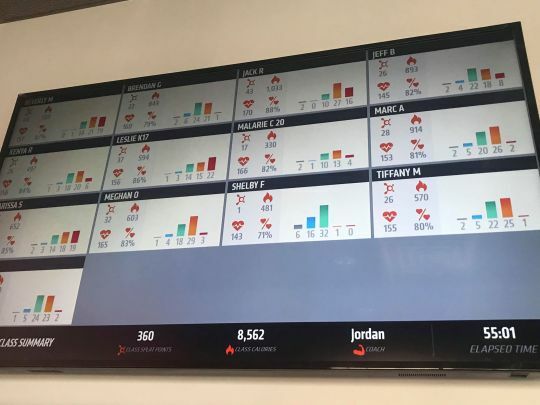 A big screen hanging above the cardio equipment continuously displays your name, heart rate, percentage of max exertion, calories burned and “splat points” (how often your heart rate is in the “orange zone”). This “zone” approach definitely gives you continuous motivation. I know personally, each time I looked up, if I wasn’t in the correct zone, I would fight until I reached it (this meant digging deep a few times). Within minutes I received an inbox with my heart rate and zone summary 🧡. My overall opinion of OT summed up in one word, effective. I personally will not use OT as my only form of exercise- I am first and foremost a weightlifter. Olympic weightlifting and compound lifts are my jam, but when it comes to shredding, cardio is a must, and this approach, I feel personally is the best for optimal results. Interval training is hands down the best method of cardio when it comes to getting the most “bang for your buck.” What I mean by this is…you can spend an hour on the eliptical and burn 500 calories doing steady state cardio, or you can spend an hour doing high intensity interval training (HIIT), burning 500 calories, plus causing excess post-exercise oxygen consumption (EPOC), also known as the “afterburn.” This causes a stimulated metabolism and increased energy for hours post-workout. Continue to follow along as I share my experiences while exploring the versatility of fitness. By expanding and diversifying my routine, I hope to find new elements that will continue to target any weaknesses within my training.